This is not a film worth recommending, says Raja Sen.
Ram Gopal Varma has never been one to let truth get in the way of a good story. His new film, Veerappan, for instance, opens with a quote that 'a Society gets the criminal it deserves,' which is credited to Voltaire, who -- to my knowledge -- never said any such thing. The rest is classic RGV, from the decision to give the quote a loftier source -- to get people to instantly take it more seriously, I imagine -- to the much odder (yet much more harmless) decision to capitalise the S, making it look like there’s a serial killer lurking around the offices of Society Magazine. Simply put, there is much Varma does that confounds everyone else on the planet. The opening credits, with crew names underscored by bloodied elephant tusks, are superimposed over a Veerappan slaughter as the infamous bandit massacres a man. The cops, as always on the scene a few moments too late, lament their helplessness in the face of this fearsome foe. Sachin Joshii -- playing a policeman identified in the closing credits simply as Cop -- briefs an army squad, rookies to the Veerappan situation, with an origin story, and Varma does well to start this off as a first-person flashback, showing us, video-game-style, what Veerappan sees when but a child holding his first gun. It is during these early shots that we are thunderstruck by Sandeep Bharadwaj, the actor who plays Veerappan, and how much of a dead ringer he is, at least from behind that iconic moustache. 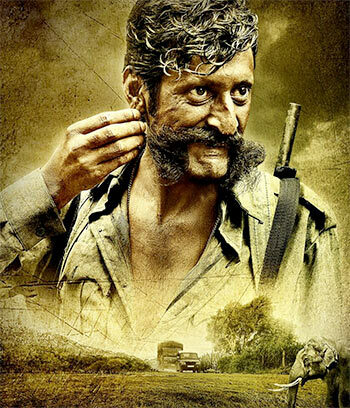 Varma flits through many a shot of wall-to-wall violence and there is one shot of Veerappan, dressed as a cop, hacking down a victim with an axe, that shows off the look, the level of violence and the actor’s presence as cultivated by the director. It is a shot that endures. That, however, is about it. Things get less and less interesting as the movie chugs on, a potentially compelling story reduced to something tedious. Joshii, mouthing aphoristic masala lines of dialogue like a child reciting words he doesn’t understand, is the film’s weakest link, and it doesn’t help that he’s always around on screen. The man has absolutely no charisma, which is why Varma’s attempts at giving him ‘hero’ moments never quite work. Usha Jadhav, playing Veerappan’s wife, is natural but her performance positively jars alongside that of the atrociously dubbed Lisa Ray, who -- as a spy trying to befriend Veerappan’s wife -- brings a near (Nargis) Fakhri-esque blankness to the part. The first time we meet Ray, she stares at a photograph of her combat-slain husband as if stoned out of her skull. What I liked about Veerappan is the fact that RGV is relentless, plodding through his plot dedicatedly, without feeling the need to add a funny line or an item song (though it is rather distracting that the Veerappan theme song borrows its backbone from, bewilderingly enough, Snoop Dogg’s Wiggle) and this, I feel, is because he truly believes in the power of the subject. Tragically, his visual aesthetic at this point isn’t thrilling enough -- or new enough to be mistaken for being interesting -- and, thanks to weak plotting and Joshii’s awful lines, the film ends up long and bloated. This, then, is not a film worth recommending. And yet there are some images that stay with me -- like the aforementioned one of the dacoit as a cop, and one featuring, alongside the men, female cops in red and yellow sarees, gamely wading through water and firing at the outlaws -- which convince me that Varma isn’t sleepwalking through the project. Also, as Hindi films go, it’s surprisingly no-nonsense for the most part, save for Joshii. It knows what it wants to do and while it can’t quite pull it off, it certainly kidnaps our attention for a while. It may well be a misfire, but Veerappan shows that at least RGV has his eyes open while squeezing the trigger. The dacoit is still at large.